Saturday, March 1st, 10-2pm Walt Whitman Historic Birthplace, West Hills, N.Y.
Saturday, April 14, 2007, 10-3pm, King Hooper Mansion, Marblehead, MA, all proceeds benefit Marblehead Arts Association Thank you to all who attended raising over $1800 for the Marblehead Arts Association in one day! January 29, Oakham Historical Society, Oakham, MA 1-4pm, Appraisal Day Over $750 was raised for the Oakham Historical Society! 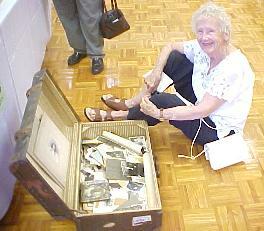 Saturday, May 1, 2004 appraisal day raised $900 for the Princeton, MA Historical Society! On Saturday, April 3, 2004, Appraisal Day helps to raise almost $1400 for the church in Westboro, MA! Saturday April 5, 2003, Paxton Center School, Paxton, MA / Raised over $650! Event helps the Paxton Center School auction raise $24,000 for the playground! Saturday April 26, 2003, Fitchburg Historical Society / Raised over $800! Saturday, May 3, 2003, 1st Congregational Church, Shrewsbury, MA / Raised nearly $1000! Copyright 1999-2019 Appraisalday.com. All rights reserved.